He was born in 1563. He was the third son of Guru Ram Das ji. Guru Arjan was a saint and scholar of the highest quality and repute. 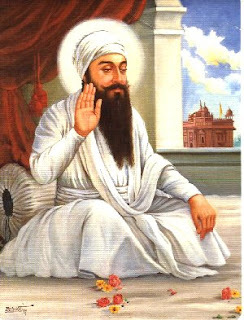 He compiled the Adi Granth, the scriptures of the Sikhs, and wrote the Sukhmani Sahib. To make it a universal teaching, Guru ji included in it hymns of Muslim saints as well those of low-caste pariah saints who were never permitted to enter various temples. Guru Arjan Dev completed construction of Sri Darbar Sahib also known as Golden Temple in Amritsar. Sri Darbar Sahib welcomes all without discrimination, which is symbolised by the four doors that are open in four directions. Guru ji became the first great martyr in Sikh history when Emperor Jahangir ordered his execution.